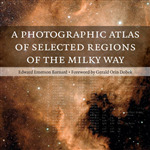 Reproduced in print for the first time, this book combines both volumes of Barnard's Photographic Atlas of Selected Regions of the Milky Way. It directly replicates Barnard's text, with high-resolution images of the original photographic plates, and a pull-out of the 50 plates combined in a panorama. In this new, digitally re-mastered edition, 'The Hatfield Lunar Atlas' has been extensively updated to accommodate the digital imaging equipment and capabilities of 21st century amateur telescopes up to and beyond the 12-inch aperture. Unique atlas with 144 maps covering the entire Moon. Indispensable reference for planetary and space scientists, lunar enthusiasts and astronomers.